Back in the mid 90's, monoblack was my favorite archetype. Maybe it was something special with the scary-looking artwork, the flavour of cards like Lord of the Pit and Royal Assassin, or just the fact that my black deck could actually beat most comers during the lunch breaks at school. Back then, Nettling Imp (or Norrit) plus Sorceress Queen and Sengir Vampire was seen as a deadly combination. The old school players of today have optimized the monoblack strategy quite a bit from that. The top performing decks from WSK are finally up in the Decks-to-beat section. The top4 consisted of a The Deck, a Zack Dolan Control, an UGR Burn and a "4-color black" beatdown. I haven't seen all the lists from Warcon yet, but I can tell you that the finals was between a monoblack deck (played by Erik "Sehl" Larsson) and a monoblue (played by Elof). Amnesia has really shown itself as a powerful card the last few months, in particular with plays like turn 1 Mana Vault, turn 2 holding up two islands for Counterspell, and turn 3 Amnesia. I'm hoping for a tournament report from Elof, but for now we can take a look at a few pics from the tournament (thanks to Kalle, Elof and Freespace for the pics). 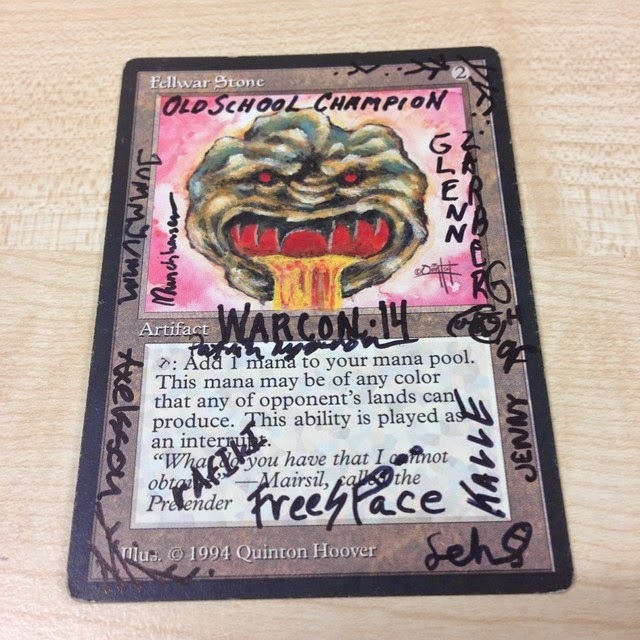 I'll be posting decklists from Warcon as soon as I get them. Sometimes, I need to take a step back. Most of us know that playing an expensive deck in competitive formats is a luxury, and not a right. Even in casual formats, not all cards are accessible unless you make a conscious prioritization and decide that owning these cards are more valuable to you than using that money on something else. It could be due to the joy of the game, the joy of owning a piece of history, or simply the joy of luxury. "Luxury is a necessity that begins where necessity ends", to quote Coco Chanel. Sometimes you need to ask yourself 'why?' though. A week ago I got one of the very last cards for my Project M deck, and the question was more present than ever. Last weekend the Wexio Gaming Convention was held in Växjö, Småland. Around the board games, steam punks and NES consoles there was old school Magic going on. I'm aiming to write a longer report about the weekend, but for now we'll have a look at some pics from the tournament.